Product #60778 | SKU 996000905 | 0.0 (no ratings yet) Thanks for your rating! 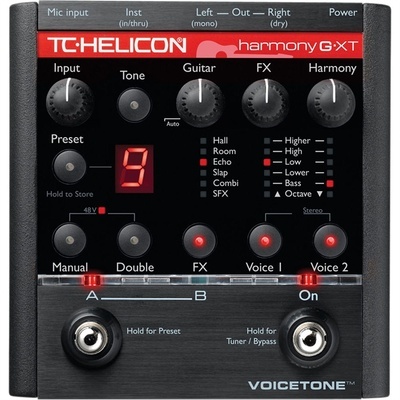 The VoiceTone Harmony-G XT from TC-Helicon is a vocal and guitar effect processor pedal that features pitch detection, pitch correction, harmony and built-in FX. Featuring presets in a wide variety of musical styles, VoiceTone Harmony-G XT gives singing guitarists a plethora of sonic possibilities. VoiceTone Harmony-G XT features auto chromatic pitch correction that shifts your voice closer on pitch, making you sound more in tune with the music. The unit detects the key of what you are playing on your guitar and adjusts the pitch of your voice accordingly. In addition, VoiceTone Harmony-G XT also listens to your performance and automatically decides what harmony notes would sound best with your song. Connect your guitar and a mic, choose one of the presets, play guitar and sing. No special guitar pickups, pre-programming, or extensive musical knowledge are required in order to use Harmony-G XT.